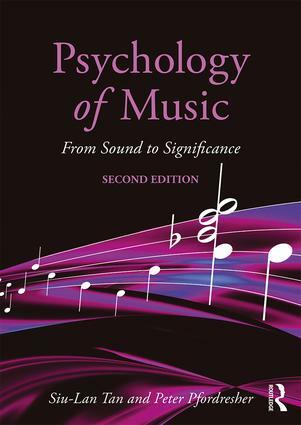 In Psychology of Music: From Sound to Significance (2nd edition), the authors consider music on a broad scale, from its beginning as an acoustical signal to its different manifestations across cultures. In their second edition, the authors apply the same richness of depth and scope that was a hallmark of the first edition of this text. In addition, having laid out the topography of the field in the original book, the second edition puts greater emphasis on linking academic learning to real-world contexts, and on including compelling topics that appeal to students’ natural curiosity. Chapters have been updated with approximately 500 new citations to reflect advances in the field. The organization of the book remains the same as the first edition, while chapters have been updated and often expanded with new topics. 'Part I: Foundations' explores the acoustics of sound, the auditory system, and responses to music in the brain. 'Part II: The Perception and Cognition of Music' focuses on how we process pitch, melody, meter, rhythm, and musical structure. 'Part III: Development, Learning, and Performance' describes how musical capacities and skills unfold, beginning before birth and extending to the advanced and expert musician. And finally, 'Part IV: The Meaning and Significance of Music' explores social, emotional, philosophical and cultural dimensions of music and meaning. This book will be invaluable to undergraduates and postgraduate students in psychology and music, and will appeal to anyone who is interested in the vital and expanding field of psychology of music.